This post is a supplement to the main post on adding a front band opening to a starter pattern. That got so long, I’ve separated off this list of suggestions about what to do with your pattern once you’ve made it. A zip or button band finishes the front opening edge – what to do with the neckline ? The common neckline finishes are bias binding/facing, or a stand collar. If possible, sew the neckline treatment after the shoulder seams but before the side and sleeve seams. It’s much easier to do it while the fabric is nearly flat. This post ends with some ways you can vary the pattern slightly to make other looks. Often the neckline is finished with bias binding or bias facing. Staystitch the neckline, as a bias strip doesn’t add any stability. Here are links to some tutorials on bias binding. I’m preparing a tutorial on sewing bias facing without distortion, not a quick process. 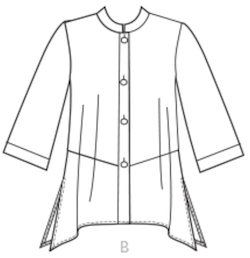 Here’s a free pattern from Colette patterns with several collar ideas. These are patterns for a top with no front opening, so can’t be used directly, but are a source of ideas. Simply add a curve with seam allowance instead of the CF fold ? You can borrow many collar shapes from other patterns and add them into the neckline seam between main body and bias facing. top – baste collar to neckline. middle – black overlayer is wrong side of bias strip – stitch together bias strip-collar-body, clip seam allowances so they lay flat. bottom – turn down the bias strip, turn in the edge and sew down by machine, or hand stitching can be less visible. Finish the neckline with a stand collar which ends at the outer edge of the front opening, so it covers the top of the band. This may be called a ‘Mandarin’ collar. There may be a button if the ends of the band overlap. Use a collar from another pattern. Or here’s a post on making a pattern for a collar band which comes to edge of front, from The Creative Curator. The lower notch matches the shoulder seam. The upper notch marks the end of the upper collar, if used. Band collar sewing video from Professor Pincushion. Here’s a detailed photo tutorial on sewing a band collar, from Andrea Brown of Four Square Walls. Use just the band, or both parts of a 2-piece collar. When adding a collar/hood you need to match the neckline stitching line lengths of body and collar/hood. Match length of collar to – neckline length from CB to CF. Match length of collar to – neckline length from CB to outer edge of finished band (or outer edge of facing). Notes in this post on how to measure the stitching line, and change the length of a collar pattern. There’s another style of stand collar, called a ’Nehru’ collar, where the end of the collar band is inset from the edge of the front opening. A more complex pattern make and sew when combined with front bands, so I’m not covering it here. This sort of collar is tricky to combine with front bands but easy to add with a facing, see post on adding to a front-neckline facing. Add a seam instead of the centre fold of a separate band. Then there is a seam on both sides of the band, so you can add in decorative trims. Add piping, lace, frills, fringing etc. into the neckline edge seam between body and bias facing. Or finish the neckline edge with a true facing. See next post about facings : pattern making, sewing, using. Can add a collar simply by using a full facing too, see that post. There are front band openings I haven’t included – I’ve gone for the easy ones. Full length opening with covered/hidden buttonholes. Half length opening : exposed zip, polo, henley. Hmm – some day I’ll look for good tutorials on patterns for these. . . There are many little design decisions to make about openings. I give the conventions, but make adjustments if you want to. Do what professional designers do – if it doesn’t work out quite right, change things a bit and try again. Use your own judgement about what is right and what isn’t. Or collect examples of what you like. This entry was posted on December 6, 2018 at 10:16 am and is filed under pattern making for clothes. You can subscribe via RSS 2.0 feed to this post's comments. Both comments and pings are currently closed. This is just what I was looking for! Thank you for your generosity in sharing your knowledge. Thanks for your comment Diane – I’m the sort of person who clarifies my thoughts by writing them out !